Showcase two of your favorite outdoor accents and your love of birds simultaneously with these Esschert Design Aged Brown Cast Iron Bird Silhouette Hooks. Two striking bird figures, along with a wealth of stylized leaf shapes, create these two fantastic and hardy hangers. Their cast iron construction provides durability, and their distressed brown finish offers plenty of dimension. A small, upward curl completes each bracket, perfectly accommodating hanging adornments up to 13" in diameter. An extended, back arm on each affixes to a wall or post easily, and the cast iron body is fantastic for indoor or outdoor use. Display several beautiful avian shapes with your hanging adornments using these Aged Brown Cast Iron Bird Silhouette Hooks. 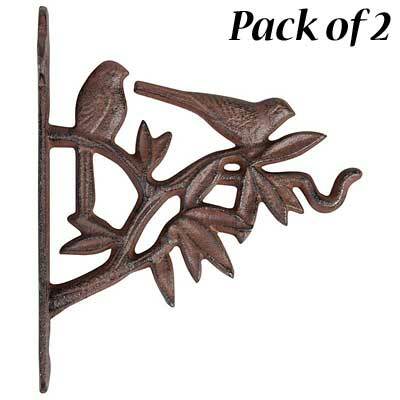 Note: This package contains 2 of the Esschert Design Cast Iron Bird Silhouette Hooks, Aged Brown. Whitehall Cardinal Nature Hook, Oil Rub Bronze, 14.75"